Dubai: Despite the claims made by the Indian Consulate of passport issuance within seven working days, many Indian expatriates have complained of inordinate delays of 40-60 days in getting their passports renewed. As per international regulations, handwritten passports are not acceptable and those applying for renewal or additional books or addition of a name have to go in for a new printed passport. The handwritten passports will not be acceptable after November and that would partially explain longer queues at BLS, the official agency partnering with the Indian Embassy and Indian Consulate to process passsports and visas. In case of individuals from the state of Kashmir, the police verification takes longer than a month sometimes and passports from that state take notoriously longer than 50 days to be issued. Abid Hussain, from Sharjah, was livid that although he has been a UAE resident since 2007, his passport renewal took over 60 days. “I think there is plain discrimination with Indians who hail from Kashmir.I do not understand why the police verification needs such a long time in case of renewal of an existing passport. Despite tall claims made by the passport officials I was really upset when after 40 days I had no clue about when I would get my passport. On the 58th day of my application, my mother informed me from Srinagar of the visit of a policeman and I got my passport after 60 days after lodging official complaints. I had to travel on important business to Oman but could not do so for two months,” he complained. The systems in BLS are pretty streamlined. Upon a visit to its Khaleej Centre branch in Bur Dubai, it was evident that the place worked seamlessly with token systems and diligent queues. S. Santhanam, who had been sent back to get some additional documents, said that he had come in at 10am and had been unsuccessful in filling up the necessary documents. However, Hassan Shareef, who had come to apply for renewal of his passport, begged to differ. 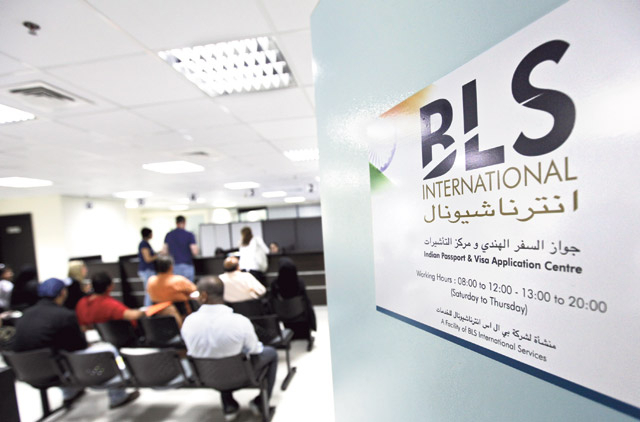 “About five years ago I was pleasantly surprised when I applied for my daughter’s application at the then BLS branch near the Al Karama post office. However, now I had to wait from 3pm to 7pm just to submit my application even though I had verified the accuracy of my form well before 3pm. Expecting working people to waste half a day in queues is far from efficient and certainly not acceptable to anyone,” he said angrily.